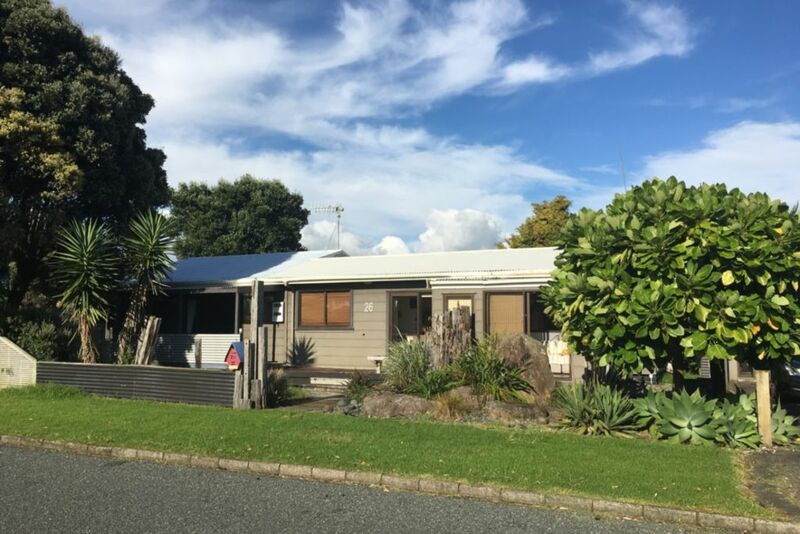 The best of both worlds with an easy stroll to the sand and surf of Waihi Beach and to shops and cafes in the village (both are literally just a couple of minutes away!). Enjoy a comfortable bach with a large fully fenced section and gorgeous gardens - there is even space for tents! Children will love the outdoor space, table tennis, and darts, as well as being so close to the surf beach and shops. There is a deck for every occasion and beds for everyone in the house or sleepout (NB: there is minimal heating in the sleepout - it is best for summer). A fully stocked bookcase and many garden seats invite you to relax. The closest beach access is in very easy walking distance - only 260m away! Free-standing wood fire in the family room. Parking is available in the driveway and on the street in front of the house. Indoor free-standing wood fire in family room. Also connected to a DVD player. My family thoroughly enjoyed ourselves in Megan’s home. Super handy location to both the shopping centre & beach, both within an easy flat stroll but located on a nice quiet street. The home comforts were a welcome addition and we enjoyed family time playing board games and puzzles. It was the perfect place for our young children to play safety & we loved the spaciousness combined with that classic kiwi bach feel. Thanks again Megan for sharing your home with our family. The whole family loved this bach. Plenty of room, comfortable, lots to do, great outdoor spaces, good location. Hope to be back! We loved the Bach. Was perfect for us. Loved the games etc. Comfy beds. Lots of room inside and out. Room for boat. Will be back. We have stayed here quite a few times and love it. We have stayed here quite a few times and love it. It is always clean and comfortable to stay in. It has everything in it, including toys/games/activities, which means we don't have to cart all of these things on holiday with us. A great location and sized house, with loads of games and activities, we had a lovely stay. Waihi Beach is still a laid back beach village, with many traditional kiwi baches. Enjoy days at the beach or in winter, at the Athenree Hot Pools (an easy 10 minute drive away). For an active option, go cycling on the Hauraki Rail Trail, or head out on one of the many walks in the area or along the beach.